We like to travel with our Private Motorhomes so if yoy want to see the Painted Desert or would like to travel in a Private Coach give us a call. Take your friends and family and let me show you those places in Luxury. The Painted Desert encompasses over 93,500 acres and stretches over 160 miles. It begins about 30 miles north of Cameron, Arizona near the southeastern rim of the Grand Canyon to the Petrified Forest about 26 miles east of Holbrook, AZ. Along the way, it grazes the backyard of the Wupatki National Monument Indian Ruins. The Painted Desert derives its name for the multitude of colors ranging from lavenders to shades of gray with vibrant colors of red, orange and pink. It is a long expanse of badland hills and buttes and although barren and austere, it is a beautiful landscape of a rainbow of colors. It took millions upon millions of years for nature to create this natural canvas of unimaginable design that some describe it as a multi-colored layered cake. The Painted Desert draws upon the earth’s indecisive nature. From shifts in the earth’s crust brought about by temperamental volcanoes and earthquakes to complete inundation by fresh and sea waters alike, a veritable host of elements have breathed life into this area. Colorful sediments of bentonite clay and sandstone, stacked in elegant layers, feed off the setting Arizona sun in an ever-changing display of colorful splendor. The most visited area of the Painted Desert is its eastern-end about 115 miles east of Flagstaff, Arizona. Both the Painted Desert and the Petrified Forest are about 26 miles east of Holbrook on Interstate 40 where you will find the Painted Desert Visitor's Center. The western-end of the Painted Desert can be accessed north on US 89 from Flagstaff AZ. Drive north past Cameron, into Tuba City. One could spend several hours meandering along either of these routes, enjoying the views, stopping for photo opportunities and shopping at trading posts and gift shops along the way. You simply cannot fully experience the wonders of the Painted Desert, however, without visiting the Petrified Forest National Park, which also sits about 25 miles east of Holbrook, Arizona, next to the Painted Desert. The handiwork of erosion, water, and silica, the remnants of this once magnificent pine forest have taken millions of years to resurface, and sparkle like so many diamonds. 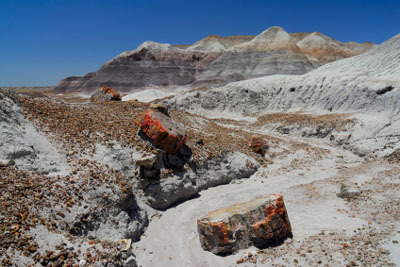 Once the stomping ground of dinosaurs and other prehistoric residents, the Petrified Forest continually reveals the skeletons of its stormy past. Holding the largest known concentration of solar calendars, this National Park also provides the opportunity to explore the lives of the ancient Indian tribes who once wandered this area and made it their home. Sites such as the Puerco Pueblo and Agate House are standing monuments of the ingenuity of the ancient tribes. While life went on here amongst the painted peaks, modern civilization didn’t begin to discover its existence until the 16th century. Spanish explorers who passed through are said to have named it "El Desierto Pintado", when confronted with the colorful horizon. From that point on, with the ancestral inhabitants long vanished, a variety of humans came and went, and in the 1800’s, military personnel, ranchers and tourists would venture on the scene. 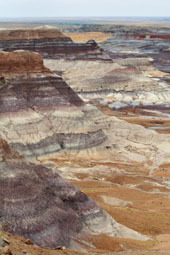 In 1906, after years of looting the finite supply of petrified wood, selected areas were designated as the original Petrified Forest National Monument. Gradually more acreage was purchased and protected under both the Petrified Forest and Painted Desert names. Modern-day civilians are privy to an array of artifacts that have been collected and preserved at the Petrified Forest National Park museum. National Heritage Areas have been established in order to promote conservation and education about the seemingly endless history of this fragment of the planet. Along with the historical and educational aspects, many tourist-directed sites have been established over the past century. One such location is the Painted Desert Inn, built in 1924 by Herbert Lore. Originally designed for purposes of lodging and other tourist services, such as meals and shopping, the inn was purchased by the National Monument in 1936. After a brief period of closing during World War II, the Fred Harvey Company assumed management responsibilities in 1947. A short time later, the famous architect of many Grand Canyon attractions such as the Desert View Watchtower, and Hopi House, Mary Colter was brought in to redesign portions of the Inn. With progress comes destruction, however, and the Inn was closed when I-40 took over for Route 66. Abandoned and decaying for 27 years, this desert oasis faced total demise twice before being placed on the National Register of Historic Places in 1975. Today, Painted Desert Inn has been restored and serves as a tourist point with a gift shop and bookstore, but no longer provides lodging facilities. Today, the Painted Desert and Petrified Forest are protected lands that offer a rich history of numerous ancient peoples, a breathtaking assortment of views, and a picture of life as only the dinosaurs knew it.